Author Note: Forever Ink was previously found in the Hot Ink Anthology. Boy it's hot in here! 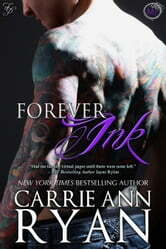 I've only just found Carrie's books and I can say with certainty that I'm a solid fan of her work. I love her characters from her alpha men to her strong women. I can't wait to read the rest of her books. Short and sweet but a powerful love story about two very different people who had more in common than expected.